Lifting off from Cape Canaveral on the 60th anniversary of the launch of Explorer 1, the first U.S. satellite, the commercial booster rumbled into a clear late afternoon sky a day after SpaceX scrubbed a countdown to replace a sensor on the Falcon 9’s second stage. The 229-foot-tall (70-meter) Falcon 9 rocket fired nine Merlin 1D main engines and climbed away from Cape Canaveral’s Complex 40 launch pad at 4:25 p.m. EST (2125 GMT), launching a few miles from the site of Explorer 1’s historic blastoff from the Complex 26 launch facility on Jan. 31, 1958. The Falcon 9’s engines gimbaled to steer the rocket on a trajectory east from Florida’s Space Coast, and the rocket’s first stage booster — reused after a launch in May 2017 — shut down and detached for a descent into the Atlantic Ocean. About a minute later, the composite shroud that protected Luxembourg’s GovSat 1 communications satellite during the initial stages of liftoff jettisoned, shedding weight for the Falcon 9’s upper stage powering into orbit. 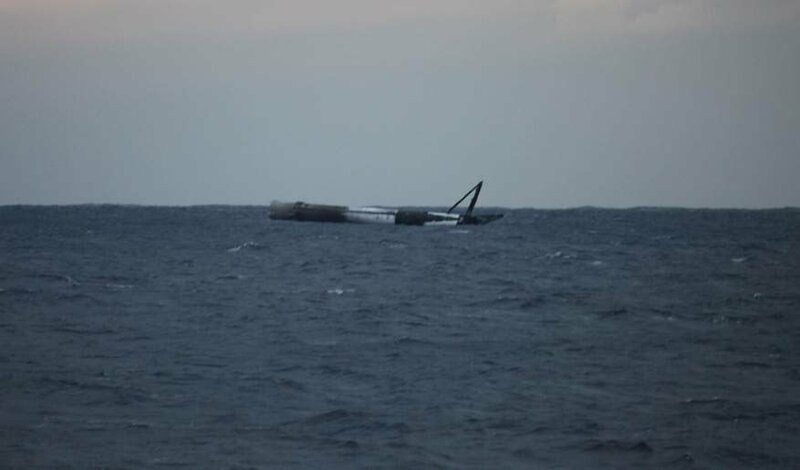 The Falcon 9 rocket’s booster stage made a controlled splashdown at sea a few hundred miles east of Cape Canaveral, testing the effectiveness of a high-thrust landing burn using three of its engines, instead of the usual one. As expected, SpaceX’s drone ship was not in position to recover the first stage as it normally does, but the Falcon 9 booster on the GovSat 1 mission was fitted with landing legs and grid fins, hardware necessary for a controlled descent. 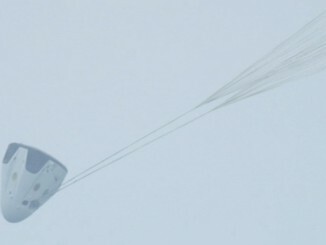 Elon Musk wrote on Twitter that the recovery team will try to tow the first stage back to port. Meanwhile, the upper stage’s single Merlin engine shut down around eight-and-a-half minutes into the mission after reaching an initial parking orbit. The kerosene-fueled engine reignited about 18 minutes later for a roughly minute-long firing, aiming to place GovSat in an elliptical, high-altitude “supersynchronous” transfer orbit stretching as high as 36,000 miles (58,000 kilometers) above Earth at its highest point. 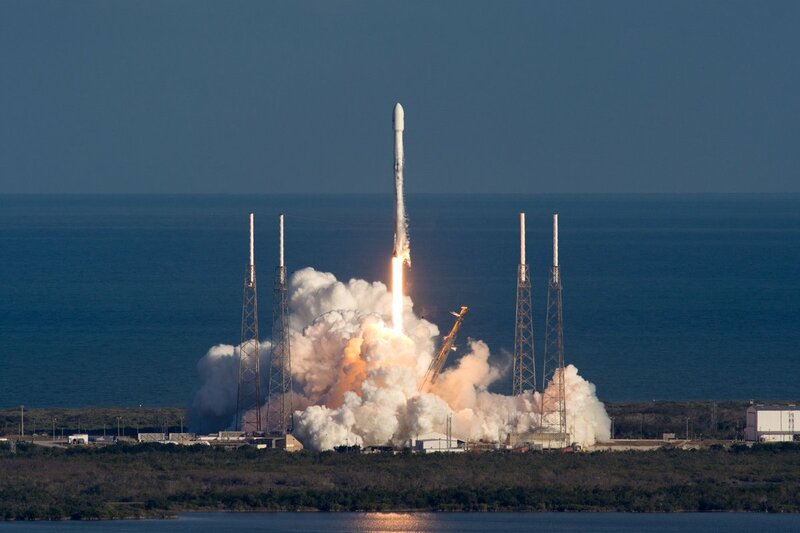 The Falcon 9’s upper stage deployed the 9,325-pound (4,230-kilogram) GovSat 1 spacecraft, also known as SES 16, around 32 minutes after liftoff. Owned by GovSat, a public-private joint venture between SES and the government of Luxembourg, the new satellite will offer secure, military communications services for Luxembourg authorities and the country’s allies in Europe and NATO. SES declared the mission a success in a post-launch press release. GovSat 1’s on-board thruster will reshape the satellite’s orbit to reach a circular path around Earth’s equator. Several orbital adjustment maneuvers are planned in the coming weeks, and GovSat 1 should reach its perch in geostationary orbit at an altitude of nearly 22,300 miles (35,800 kilometers) by mid-February. In a briefing with reporters before the launch, Biewer said GovSat 1 should be operational by the beginning of March, once the satellite reaches its final orbit and completes activation and testing procedures. The satellite project was financed with 100 million euros ($123 million) invested in a 50-50 shareholder arrangement between SES and the Luxembourg government, plus a 125 million euro ($154 million) loan from a consortium of Luxembourg banks. 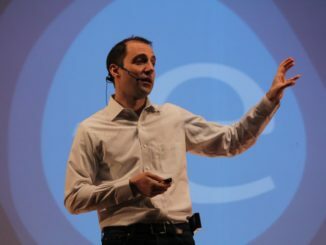 The startup investments and loan covered GovSat’s founding costs, and the procurement of the GovSat 1 spacecraft and its launch on a Falcon 9 rocket. 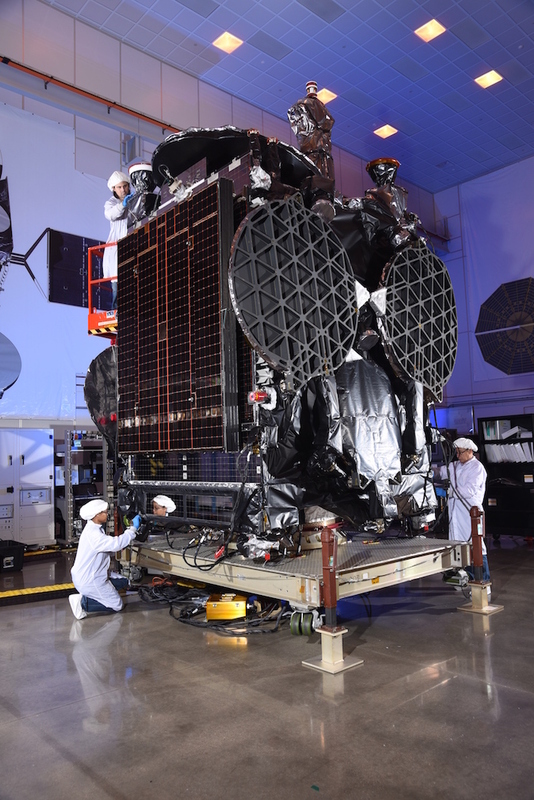 Built by Orbital ATK, GovSat 1 carries Ka-band and X-band telecom equipment to relay data, radio signals and other communications across a zone stretching from the Atlantic Ocean to the Indian Ocean. Parked in geostationary orbit at 21.5 degree east longitude, GovSat 1 will move around Earth in lock-step with the planet’s rotation, giving it a fixed geographic coverage range. GovSat 1 will provide military units deployed by Luxembourg’s European and NATO allies secure communications links via fixed land positions or antennas on ships in the Mediterranean Sea, the Baltic Sea, and the Atlantic and Indian Oceans. GovSat 1 merges the secure, encrypted telecom capabilities of traditional government-owned military communications satellites with a commercial business model, resulting in cost savings. “In X-band, we are featuring a so-called global beam, probably the highest power that is available on the market today, and this is very well suited for providing support for maritime and land-based operations,” Biewer said. “It will also be featuring five steerable X-band mission means that provide high-power support for mobility applications in this very resilient frequency. 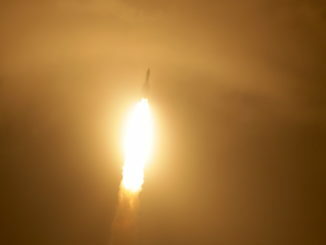 GovSat 1 is not hardened against a nuclear attack, like some government-owned relay satellites, but engineers built the satellite to be resilient to jamming and other threats. GovSat 1 will support military operations, civilian security forces, emergency responders and border forces, including patrols in the Mediterranean Sea, a region trafficked by migrants from the Middle East and North Africa. A contingent of dignitaries from Luxembourg traveled to Cape Canaveral for GovSat 1’s launch, including Bettel and Etienne Schneider, Luxembourg’s deputy prime minister. Luxembourg’s Heriditary Grand Duke Guillaume and his wife the Heriditary Grand Duchesse Stephanie were also present for the launch. For SES, GovSat 1 is an opportunity to expand the company’s reach into the international government services market. SES already has a unit based near Washington, D.C., to oversee the company’s business with the U.S. government, but its role is restricted outside the United States, according to Karim Michel Sabbagh, CEO of SES. Sabbagh said GovSat 1 will help SES’s ongoing support to help respond to natural disasters, providing telecom services in the aftermath of earthquakes and hurricanes. Humanitarian and peacekeeping missions in Africa could also be aided by GovSat 1. SpaceX will follow Wednesday’s launch with the long-delayed debut flight of the Falcon Heavy rocket as soon as Tuesday, Feb. 6, from launch pad 39A at NASA’s Kennedy Space Center. The triple-core rocket, made of three Falcon 9 booster stages bolted together, has a three-hour launch window Tuesday opening at 1:30 p.m. EST (1830 GMT). Once SpaceX’s Falcon Heavy clears the pad, two more Falcon 9 missions are on track for liftoffs in February with Spanish-owned satellites. One Falcon 9 rocket will lift off Feb. 17 from Vandenberg Air Force Base in California with the Spanish Paz Earth observation satellite, followed by a Falcon 9 launch from Cape Canaveral around Feb. 22 with Hispasat 30W-6, a multipurpose telecom craft. Wednesday’s launch came 60 years after the first U.S. satellite, Explorer 1, rocketed into orbit from Cape Canaveral aboard a Juno 1 launcher designed by Wernher von Braun and his team of German and U.S. scientists at Redstone Arsenal, Alabama. NASA and U.S. Air Force officials, together with surviving members of the original Explorer 1 launch team, gathered at Cape Canaveral’s Complex 26 launch pad Wednesday to celebrate the occasion and unveil a new historical marker. Designed and built at the Jet Propulsion Laboratory, the Explorer 1 satellite detected the existence of the Van Allen radiation belts, named for Explorer 1 scientist James Van Allen. Explorer 1 was the third human-made satellite sent into orbit, launching after the Soviet Union’s Sputnik 1 and Sputnik 2 spacecraft blasted off in late 1957. 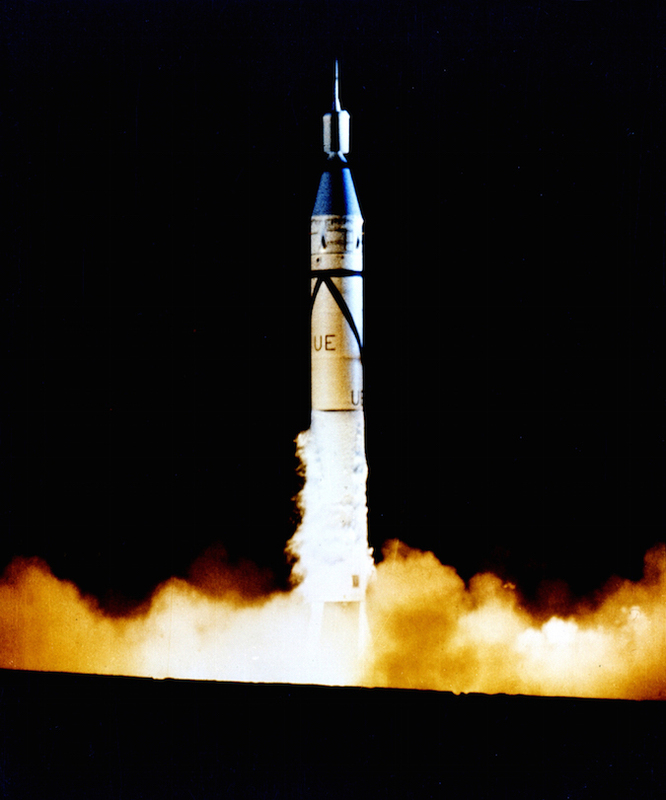 An attempt to place a small satellite in orbit with a U.S. Navy Vanguard rocket in December 1957 failed in spectacular fashion, ending with an explosion on the launch pad. “We may have gotten off to a bit of a fiery start in the beginning, but here we are now leading the world, and we launch again today,” said Brig. Gen. Wayne Monteith, commander of the U.S. Air Force’s 45th Space Wing, in remarks Wednesday shortly before the launch of GovSat 1. “With the successful launch of the SpaceX Falcon 9 GovSat mission … we will have launched 3,568 rockets from the Eastern Range, not at all bad considering how we began.